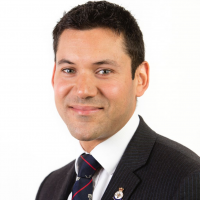 I am an international fellowship trained consultant orthopaedic surgeon working in Salisbury with specialist expertise in Foot & Ankle surgery and complex limb reconstruction. I treat all Foot & Ankle conditions from the simple to the very complex. Problems I routinely treat include bunions, arthritis, sports injuries, deformity and trauma. I am happy to be able to offer various surgical techniques and treatments and will work with you, the patient, to select the most appropriate treatment for you. Surgical treatments I offer include percutaneous minimally invasive foot surgery, bunion correction, ligament repairs and reconstruction, ankle arthroscopy (key hole surgery), joint fusions, complex deformity correction, ankle replacement, fracture fixation. In addition to my Foot & ankle practice I also undertake complex limb reconstruction surgery including limb lengthening, treatment of adult bone deformity, management of problem fractures and bone infection. I understand how important it is for patients to get back to doing what they love, and I will do all I can to help you return to your hobbies and pursuits. Prior to my current appointment in Salisbury, I worked as a consultant orthopaedic trauma surgeon at University Hospital Southampton Major Trauma Centre. I also served a commission as a medical officer in the Royal Air Force including operational experience as a trauma surgeon in Afghanistan. I retired from the RAF with the rank of Wing Commander in 2015. When not working I love spending time with my family, working in the garden and keeping fit. I am a keen sportsman regularly running and cycling, and I also enjoy mountaineering, climbing and skiing. I frequently participate in events such as running races, cycle sportives, triathlons and adventure races. Robinson CM, Hill RM, Jacobs N, Dall G, Court-Brown CM. Adult Distal Humeral Metaphyseal Fractures: Epidemiology and Results of Treatment. J Orthop Trauma 2003 Jan: 17(1); 38-47. Jacobs N. Unusual case of hypersensitivity – Stevens-Johnson Syndrome. Pulse 2003 Mar: 63(12); 56-57. McKirdy SW, Jacobs N, Nassab R, Starley IF. A Retrospective Review of Cold Intolerance Following Corrective Surgery for Dupuytren’s Disease. British Journal of Hand Therapy 2007: 12(2); 114-118. Jacobs N, Kane TPC, Clarke HJ. Cost of outpatient viscosupplementation. British Journal of Healthcare Management 2008 Dec: 14(12); 535-538. Garrett SJW, Jacobs N, Smith A, Yates PJ, Wood DJ. Differences in metal ion release following cobalt-chromium and oxidised zirconium total knee arthroplasty. Acta Orthop Belg 2010: 76(4);513-520. Granville-Chapman J, Jacobs N, Midwinter MJ. Pre-hospital haemostatic dressings: A systematic review. Injury 2011: 42(5); 447-459. Bulstrode H, Harrisson S, Jacobs N, Eynon A. Induced hypothermia in trauma. Journal of the Intensive Care Society 2011: 12(4); 274-280. Jacobs N, Taylor DM, Parker PJ. Changes in surgical workload at JF Med group Role 3 hospital, Camp Bastion, Afghanistan: 01 Nov 2008 – 01 Nov 2010 Injury 2012: 43(7); 1037-1040. I am happy to provide GP education on orthopaedic foot & ankle topics as well as orthopaedic trauma and limb reconstruction.